Adams, Cameron & Co. is a customer/client driven organization. We realize that growth and profitability can only be attained by providing the best possible service to our customers and clients. This has been our mission since we opened our doors, and this mission is wholly responsible for our evolution into "the area's largest Real Estate Company". I pledge to our customers and clients that we shall never lose sight of that mission. EXPERIENCE: REALTOR since 1971 and President of Adams, Cameron & Co. since 1978. 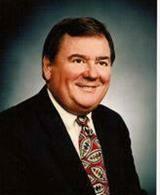 Founder and Chairman of Adams Cameron Title Services, a title insurance and real estate closing firm. Past President of the Daytona Beach Area Association of Realtors. Former member of the Board of Directors of Florida Association of Realtors. EDUCATION: Bachelor of Arts Degree - University of South Florida in both Marketing and Economics. COMMUNITY INVOLVEMENT: Chairman and Founder of Coquina Bank. Formerly served on the Board of Directors of Barnett Bank. Former member of the Board of Directors of Florida National Bank and First Florida Bank. Past member of the Board of Trustees of Ormond Beach Hospital and Board of Directors of Ormond Beach Rotary Club, where he was twice named a Paul Harris Fellow. Former member of the Board of Directors of Oceanside Country Club. Board of Directors of the Ormond Beach Chamber of Commerce. Served on the Task Force for Economic Development for the City of Ormond Beach. Member of the Halifax River Yacht Club and Quarterback Club.